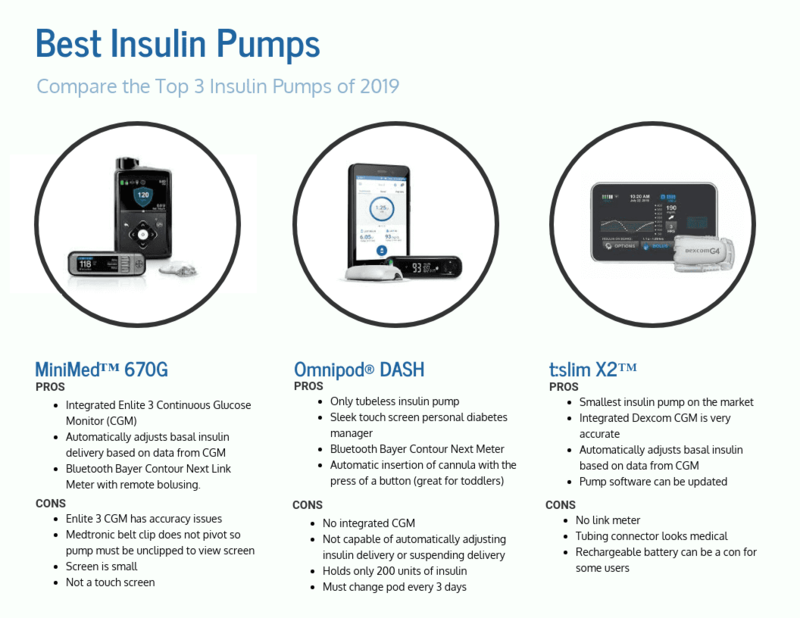 Here we will compare the best insulin pumps of 2019 so you can find the one that fits your needs. The best insulin pump for you might not be the best insulin pump for someone else, make sure you do your research. For many years insulin pumps didn’t change. They did basal and bolus, but that was about it. But in the last 5 years new insulin pumps are changing the way we manage type 1 diabetes. We are seeing a movement towards an insulin pump that requires no user input. While we are not quite there, several insulin pumps on the market include features to improve control. These range from automatic basal adjustments to continuous glucose monitoring integration. There are currently three insulin pumps that the majority of people choose, Medtronic, tSlim, and Omnipod, each of them has something that makes them unique. The best insulin pump for you depends on your lifestyle. We will layout the features of each insulin pump to help you decide which is right for you. We will only mention features that set the pumps apart, for example all the insuin pumps are waterproof and have a backlit screen so we won’t mention those features in our insulin pump comparison. Medtronic has long been the leader of insulin pumps. Their newest insulin pump, the 670G, is the first insulin pump that automatically adjusts delivery. This 670G automatically adjusts basal insulin delivery based on data from the built in continuous glucose monitor (CGM). It can suspend delivery if hypoglycemia occurs. For this reason it is considered one of the best insulin pumps on the market right now. This pump is not approved for children under 7 or for someone using less than 8 units of insulin. Some physicians will prescribe the 670G off label to a child under 7 if they deem it appropriate. An earlier version of this insulin pump, the 630G is available for children under 7. Both the 630G and 670G have the built in Enlite CGM. In the past, Medtronic’s continuous glucose monitoring systems were notorious for providing inaccurate results. Updates to their algorithm are improving the CGM accuracy. Medtronic insulin pumps include a meter capable of blousing. The meter is a great feature if you like to bolus discreetly or if you are blousing a child. The 630G and 670G have a belt clip that places the pump in vertical orientation. Some find the clip inconvenient because you can not interact with the pump easily. One major disadvantage to the 670G is the poor Enlite CGM. Many users have found it inaccurate. This is a major concern since it can adjust insulin levels based on data from the CGM. OmniPod is the only tubeless insulin pump on the market. It’s very popular among active individuals and young children. This system includes a pod and a Personal Diabetes Manager (PDM). You fill the pod with insulin and attach it to your body. The PDM controls insulin delivery. The major benefit to using a pod is there are more options for placement. Pods can go in areas where tubing can’t. Omnipod currently does not have a built in continous glucose monitor so if you wanted the CGM feature you would have to add another device, like Dexcom. However, in 2019 the new OmniPod Dash system will be released which is a step toward CGM integration and eventually to a hybrid closed loop pump. The Omnipod Dash PDM will use a Bayer Contour Next bluetooth meter. With OmniPod, there is no manual insertion of the infusion set, instead you simply connect the pod and it automatically inserts. Parents of toddlers with T1 prefer the auto insertion of the cannula. Holding a child down while inserting the site is no longer necessary. That is one of the reasons Omnipod is considered go of the best insulin pumps for toddlers. There are some disadvantages to the Omnipod insulin pump. You must change the pod every three days, no exceptions. The PDM will alert you to change your pod and it will work for 8 more hours and then it is done. Also the pod only holds 200 units of insulin, so if you are someone that uses large amounts of insulin, the Omnipod may not be for you. The tSlim is by far the most modern looking insulin pump. It has a touch screen and is the thinest insulin pump on the market. It achieves a thin profile by using a flat insulin cartridge instead of the traditional rounded one and by using a rechargeable battery. While the tSlim does not have a built in or bluetooth meter, it does have an integrated Dexcom continuous glucose monitor which is very accurate. The tSlim insulin pump also has the ability to suspend insulin delivery if glucose levels drop too low based on the Dexcom readings. In 2019, the tSlim insulin pump will be able to automatically adjust basal insulin. This in combination with it’s sleek look and small profile will likely make this the of of the best insulin pumps on the market. tSlim insulin pumps have updatable software so you can add new features without buying a new pump. tSlim also has a case and clip combo that comes in a variety of colors and the clip allows the pump to be horizontal so you can access it without unclipping it.